An anthology is always intriguing because of the different writing styles but it was the simple directive given to the authors “just write a story involving a mother somehow” that possibly made A Kind Of Mad Courage most compelling. I was expecting more tales of toddler trials and glorious newborns and was surprised by the number of stories that reflected and delved into the relationships between mothers and teens and with women and their own mother figures. I actually found myself analysing my own family’s relationships (triumphs and short-comings) while reading each author’s contribution. I’m afraid I found a few of them too hard to get through and had to go back and try again another day- those were the ones that tore at my heart so much it hurts still, just writing my review. Others foreshadowed the upcoming teen years with own daughter and made me look at my now five year old with a new love and also some good healthy fear- I think healthy fear? The one though that stuck with me the most was Julie Valerie’s LLL because it had everything in it- humour, depth of emotion, elements of frustration I could relate too and a bit of quirkiness with the scrabble words inter-mingled with the story. It made me want to play scrabble of course and at the same time made me think hard about a parent with dementia. I lost my dad two years ago and since that time I've been purposefully pushing all thoughts of losing my mother out of my mind. For me opening up to that eventuality was a good thing because it made me more aware of the now we still have. I was impressed with all the short stories in this compilation and related to each one in some way. 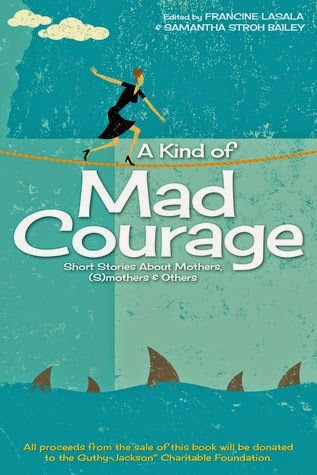 A Kind Of Mad Courage is definitely not only for those who are mothers but for everyone who has a close woman in their lives that they cherish- daughter, mother, grandmother, sister, aunt or friend. Thank you to the authors for our review copy. All opinions are our own. Kathryn, I am so happy you enjoyed LLL and I cannot thank you enough for your kind words. I, too, love the game of Scrabble and was inspired to write a story that explored the conflict between watching someone you love hold on to certain knowledge as they simultaneously lose other knowledge. The brain is a mystery but the pending loss of a mother is something no one wants to face. I am deeply touched on a personal level that you enjoyed my story. I am working on the final draft of my first novel and your review has really inspired me - more than you know! I really did enjoy LLL a lot! looking forward now to your first novel!